Do You Stick Your Neck Out When Advocating for Volunteers? 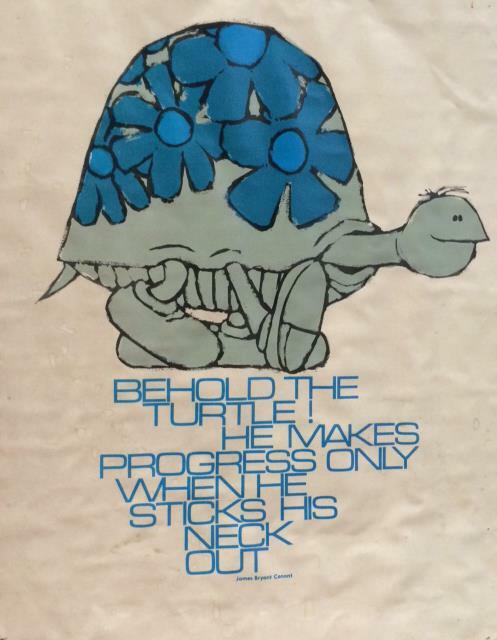 Decades ago, in my first job as a director of volunteer resources, a colleague gave me the poster pictured here. A bit battered for wear, it still is on display in a back area of the Energize office, where I see it every day. The sentiment that “sticking one’s head out” is the only sure path to progress is one that I completely believe, personally and professionally. Yet I must admit that more often than not, leaders of volunteers are bent on avoiding risk as if it is always a bad or dangerous thing. We need to examine our caution as carefully as we envision potential nightmare scenarios. Risk management is a huge topic in all organizations for many reasons. When the issues are genuinely the protection of clientele, adhering to law, or long-term viability of the services provided, it’s completely legitimate to say no to a proposal. But when the primary reason for not doing something is fear of possible repercussions, someone needs to challenge the likelihood of a problem developing. There are risks in everything we do, from getting out of bed in the morning to going bungee jumping. Clearly we each decide where to draw the line between acceptable low percentage of a problem and a high probability of a problem. Though a lot of people go bungee jumping anyway! One of our jobs as leaders of volunteers is to anticipate and diffuse resistance to a proposed volunteer role or activity – whether that resistance is from executives, line staff, or even volunteers themselves. Is the negativity a reaction to the activity itself or the disbelief that volunteers might be successful at it? Is it assumed that volunteers are inherently more risky than employees? Why? How did this proposed new activity evolve? Is there agreement that the needs addressed are real? What is the risk of not doing this service, since it is truly needed? Is there anyone else, anywhere, already doing this with volunteers successfully? What are possible risks? How likely are they to occur? How will you recruit, screen, train, and support volunteers in this effort? 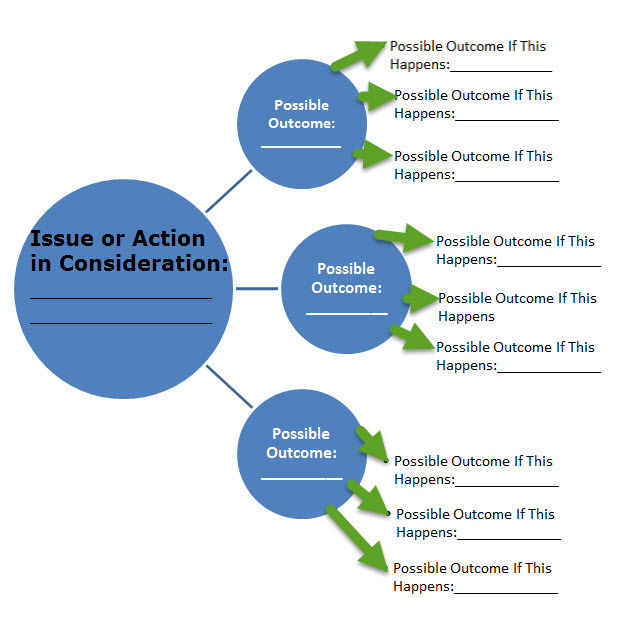 What does an action plan look like? Can it start with a small, contained pilot project to be assessed in X months and expanded as achievements are seen? Without forging into new areas of service, volunteer effort will move in a circle that, over time, is less and less relevant to the evolving needs of clients and changes in the world around us. Trying something new means progress. Below is a diagram that presents an effective way of getting past negative reactions to a proposal. You can do this with a group of people or even alone at your desk. Identify the issue or activity that you are considering taking action on. Answer the sorts of questions I just described above, to make sure your idea is clear and on target. Now brainstorm a list of all the POSSIBLE OUTCOMES of implementing this idea. Be sure to include at least a few that are the opposite of your initial reaction! In other words, if everyone thinks this is a scary or impossible idea, let them voice the worst-case scenario outcomes, but also make them consider what good might come out of this action. From this list, select the top 3 to 5 that you feel are the most PROBABLE OUTCOMES, making sure that at least one of these is opposite (good or bad) to the others. For each selected initial outcome, brainstorm all of the POSSIBLE OUTCOMES OF THAT – again making sure to consider both positive and negative situations. The value of going to this second tier of reasoning is that some actions look wonderful at first glance, but wind up moving you into problems down the road. And actions that initially seem risk-laden turn out to be temporary transition challenges that actually lead to many more positive results in the long term. If you like what you see in the second tier, it may be worth dealing with/managing the risks of the initial action to end up ultimately in a better situation. If we could apply the process I just described, we would find that a high percentage of our colleagues are simply not interested in working on behalf of a profession which they do not expect to pursue. To them this is a job, not a career; it’s a stepping stone to something they really want instead. But, for those of you who do care and want to see things change, dig deeper into the resistance to action. Perhaps the activity will end up making things easier for all participants by sharing certain tasks each person is now doing alone. Might an interim plan to spend or borrow money lead to an event that pays it back and brings in far more funds for future activities? Would recognition as an effective association leader bring increased respect from executives who have not fully realized the competence of their employee? Wouldn’t it be great for the long-term if gaining the expertise and abilities needed to do the planned activity became part of each participant’s new skill set from now on? So don’t jump to conclusions based on first reactions to an idea. Think it through and look to the second tier outcomes. And, please, stick your neck out when something matters to you! Thanks, Michele -- and remember this site is always at your fingertips for practical advice, especially in the A-Z Volunteer Management Library. I'm finally getting around to reading some back issues and this one resonated with me. In 2014 a representative from the special needs education program at our local high school approached me about using our long-term care community as a job training site for their students. This was a totally new idea and when presented to our administration was met with some resistance. By anticipating obstacles and preparing a proposal of how something like this might work for our community, I was able to gain approval for a trial year of the program. It is now in its second year and has been embraced by our staff and residents alike. Vision and persistence paid off! Susan J Ellis, Energize, Inc., Philadelphia, PA, U.S.A.
Bravo, Lynne! Thanks for sharing.